Wanted: Any clean moldings for 1969, eyebrow, hood, trunk, backup housings, etc. 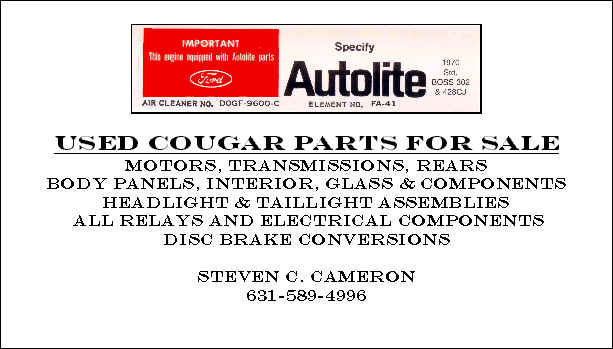 Any Ram air components, Cougar toys. Wanted: 1970 Cougar Logo floor mats in Blue. Headlight Vacuum Motors Rebuilt with your rebuildable core. $45.00. Rebuilt and refinished $55.00. Fast turn around time, usually 2 or 3 days.